"The hottest data on earth. In the coolest head in town." Johnny Mnemonic is a 1995 cyberpunk film. The cyberpunk genre tends to be dystopian with a high technology level. 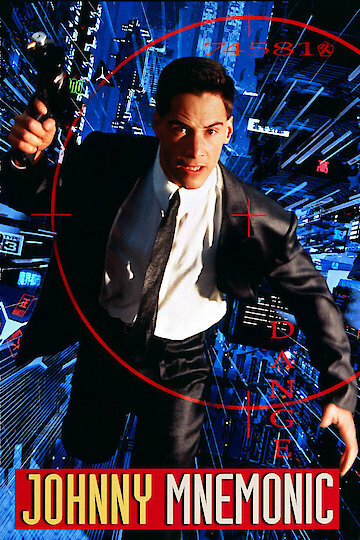 Johnny Mnemonic can also be labeled as science fiction and action. The film stars Keanu Reeves and is based on a short story written by William Gibson. William Gibson is a well-known science fiction author who is credited as one of the creators of the cyberpunk genre. Johnny Mnemonic is a very violent film, with many criminal elements presented as both positive and negative within the story. Dolph Lundgren and Henry Rollins play supporting characters on opposite sides of the spectrum. The movie travels to many places around the world, showing an international technological dystopia. The film had a very negative critical reception when it first came out, but has since gathered a devoted cult following. Johnny Mnemonic is currently available to watch and stream, buy on demand at Amazon, Vudu, Google Play, iTunes, YouTube VOD online.